I don't disagree with you, deniers love to cherry pick. Until the 30+ year trend starts to flatten I don't want to hear anything. Check out the acceleration when you overlay 30, 60 & 90 year linear trends. I think actual global warming began 45-50 years ago, after a lot of masking aerosols were removed from the atmosphere, and it's been pretty linear since then, with perhaps some recent acceleration. This never stopped deniers though. Just wait until the 2018-2019 ENSO shows up. Right now there's another warm kelvin wave sweeping from W to E in the equatorial Pacific. Odds are 65-70% for el Niño in Dec-Jan-Feb this year. Just to let you know I've started a blog which kicks off with a scoreboard of bets between 'warmists' and 'coolists' about global warming. Funnily enough the coolists don't seem to be doing very well. People usually show "global warming as a function of time" with temperature on the Y axis and time (year AD) on the X axis. But global warming isn't caused by time. It's caused by CO2 (and other gases). More specifically, temperature is supposed to increase in proportion to the number of doublings of CO2 concentration (that is the definition of climate sensitivity). Therefore, it makes sense to evaluate temperature as a function of the number of doublings of CO2 concentration. 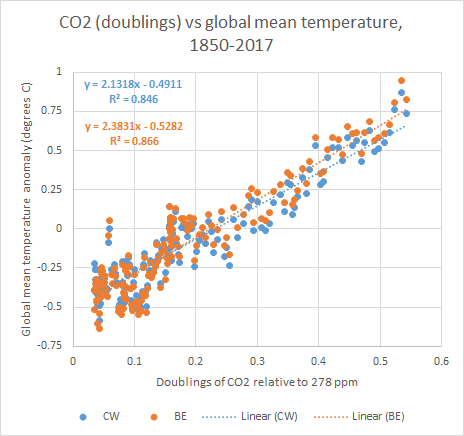 The past 50 years are certainly less noisy (and slightly steeper) but actual global warming appears to be reasonably linear going all the way back to the start of the temperature record in 1850, in direct proportion to the logarithmic increase in CO2. Exactly as expected. Obviously there are other forcings that play a role, too. But it's remarkable how clear the dependence on CO2 is, and how linear it is over 167 years! Maybe the post-1960s acceleration (compare the slopes 1850-present vs 1967-present) is due to the reduction in aerosol masking that Oren mentions. As mentioned above, I stole this from David Appell's blog. This is great. Thanks for doing it. I'm looking forward to reading the posts as you move through all the bets. I had hoped they would value their professional reputations as worth rather more to themselves than the sums of money involved. On the other hand a certain amount of intellectual dishonesty seems necessary in order to maintain the denialist mindset. Of course it could be argued that it's unfair to tar all denialists with the same brush, maybe I was just unlucky to come across the only two charlatans and the rest of the bunch are fine upstanding citizens who just happen to suffer from genuine misunderstandings. Who wants to bet on that? I do wonder how much, if any, money will actually be donated to charity when Pierre Gosselin and his gang lose their bet. Gosselin used to post sporadically about the bet, but stopped when it became obvious they were going to lose. September came in at +0.75 C on GISS-LOTI. The current 30-year trend is twice that of 1958-1988. Here's overlapping 30-years trends. 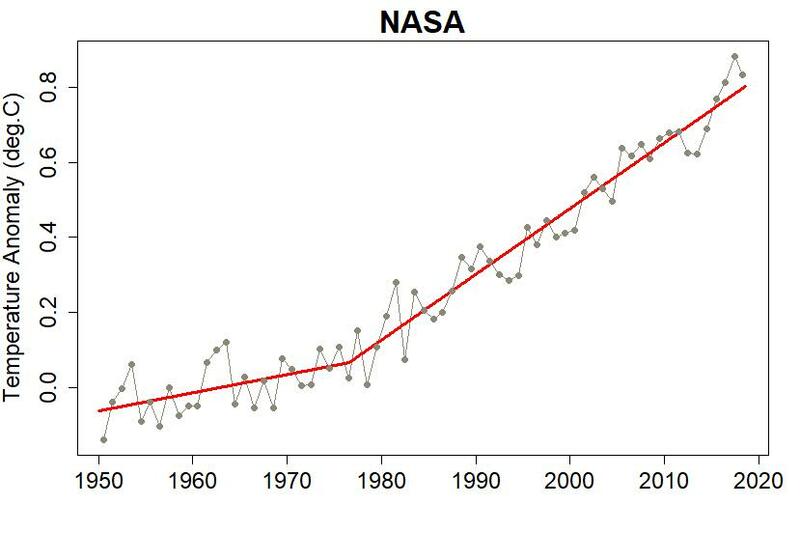 James Hansen just posted this graph a couple of days ago. Idea being that when you connect La Niña minima you get a decadal trend (for the last decade) of 0.38C. There was talk about that in the comments at Tamino's recently. I'm not the only person who was disappointed to see Hansen doing that. It's the kind of cheesy amateurish thing that you'd normally see elsewhere. Like, I remember some denialist connecting the 1998 El Nino and 2010 El Ninos in HADCRUT and saying "see, no warming". Hansen can do better than that. Thanks, and no need to apologize Ned... that's why I posted it; to get opinions on its legitimacy. Hansen defended his move by saying La Niña minima have less variability than El Niño maxima. Between the El Niño maxima and the longer term La Niña minima fits on the graph do you think it's fair to say we're at 0.24C/decade now? I think it is a good way to illustrate the point that temperature increase is accelerating. This is real and we know why - increased greenhouse gasses and ice albedo loss. This is quite different then the denialists drawing arbitrary lines that fit the data but not the real world. As much as I respect Hansen, I mostly agree with Tamino on this. There is not any convincing evidence for recent acceleration. I’ve analyzed the adjusted data, just as I have the “as is” data, to look for any significant sign of deviation from the piecewise-linear trend (in particular, anything else we can say with confidence since about 1975). It’s not there. He calculates a trend of around 0.18 C/decade since 1970. The thick orange line is a 30-year LOESS model. It is almost perfectly linear in recent decades. The slope since 2010 is 0.20 C/decade. The slope since 2000 is also 0.20 C/decade. The thinner red line is a 10-year LOESS model. It fluctuates more, but I think most of that is due to not fully correcting for ENSO and other internal variability. The slope since 2010 is 0.30 C/decade (faster!) but the slope since 2000 is the same as for the 30-year LOESS (0.20 C/decade). I think people who claim that the faster warming from ~2011 to ~2016 is "acceleration!" are deluding themselves in exactly the same way that the deniers deluded themselves about "hiatus!" in the previous decade. It's a very short-term trend and it's not significant. If the earth warms fast enough to force another breakpoint in Tamino's piecewise linear model, or to cause an upswing in my 30-year LOESS model, then I'll believe it. For now, though, I'd say the underlying warming rate is somewhere around 0.20 C/decade. It's because, while concentrations are in fact accelerating, forcing per unit concentration decreases, and the two effects happen to cancel out almost perfectly. (CO2 forcing is proportional to the log of concentration, and CH4 forcing is proportional to the square root of concentration). Sounds nice, but for some reason it's not showing for me. My understanding is that those asserting there has been an acceleration are explaining it as a result of positive feedback from the loss of arctic albedo. Certainly that is the position that Dr. Wadhams takes. Thanks. The new link works for me. That's very well done. I think I've mentioned that I dislike animations, but this one is rather good. I can't get enough of watching the last 30 years, when temperature and CO2 are moving in lockstep while solar goes in exactly the opposite direction. It nicely demolishes the (stupid) denialist claim that "it's the sun!". Of course aerosols feed directly into (negative) radiative forcing, so as we clear-up our air quality this would increase future total radiative forcing. "Acceleration is predicted by climate models for continued high fossil fuel emissions as a result of amplifying climate feedbacks and is a cause for concern. We expect global temperature to rise in the next few months and confirm that the global warming rate has accelerated." Doesn't this graph of Arctic seasonal anomalies also suggest that acceleration has been occurring? Or am I misreading it. fossil fuel emissions as a result of amplifying climate feedbacks and is a cause for concern. This is only saying using La Ninas minima is 'probably' better than using El Nino peaks. This doesn't mean the 'double the longer term rate' is a reliable measure and it seems quite possible to believe that a better methodology would remove the ENSO signal then look for acceleration in the remainder. 10 day average - that is surely weather not climate. Arctic graph looks more like point change in rate (which is acceleration) rather than ongoing acceleration. However, I think this can be explained by extra heat from albedo difference from ice to water stored in ocean then released in fall. If we see a gompertz shaped curve in the ice extent and volume graphs, then perhaps this explains the point acceleration look of the graph rather than ongoing acceleration. Not sure I understand this part. I would expect acceleration as a result of high heat capacity of oceans causing inertia so not all of effects are felt til later. Is he referring to carbon uptakes reducing in effect changing the airborne fraction? Forgive my colloquialism. I simply meant that he repeated it in a second post on his website, which suggests he's quite confident that it has some merit (which I recognize does not mean that it does). I meant that as a reply to AbruptSLR. I assumed he was referring to oceans but also to increased warming from decline in albedo due to loss of summer sea ice. I thought this was widely accepted as an amplifying (or positive) feedback? I don't quite understand your explanation for the arctic graph. The annual data looks like there could be an acceleration kicking in around 2013, which is in keeping with Hansen's graph. Again, I understand it's a rough approximation, but what I don't understand is that there would be surprise if there were acceleration, that it would be evident in the arctic, or that it would be due to the loss of arctic sea ice... Granted I'm a newb. No worries. I meant at least in part that the repetition seemed part of some timing issue with an improved version. Yes albedo feedback is widely accepted as positive feedback. It causes faster rate of rise but do you see acceleration with 'continued high fossil fuel emissions'? A really fast feedback like water vapour feedback increases the rate immediately so with "continued high fossil fuel emissions" you wouldn't expect to see acceleration. Albedo feedback from sea ice and land snow cover isn't quite so fast so maybe some acceleration but seems to me to be likely small enough to be lost in the noise. Glacier and ice sheet retreat are pretty slow feedbacks and I don't think we would expect continued high fossil fuel emissions to continue long enough at accelerating rates to keep the radiative forcing constant in order to see such acceleration. Airborne fraction changes from failing carbon sinks also seems pretty slow and again I don't think we would expect continued high fossil fuel emissions to continue long enough. So I am still confused about precisely what he is saying about feedbacks. My explanation for the curves would be high ocean heat capacity causing inertia not climate feedbacks. Edit: Perhaps he is thinking about methane emissions from permafrost and methane clathrate burbs as feedbacks from temperature rises. Ocean heat capacity inertia seems more solid explanation to me for the moment. Title: "State of the climate: New record ocean heat content and a growing El Niño"
Extract: "Ocean heat content (OHC) set a new record in the first half of 2018, with more warmth in the oceans than at any time since OHC records began in 1940." I must say, I dont understand the reasoning behind Hansen's graph. The minimums are compared with the latest reading, which is closer to the linear trend than then minimums (or course - since the minimums are below the trend and max are above... And we are currently in between). So drawing lines from the minimums to that end point will show steepening lines even if the minimums stay the same distance between the linear trend line. Its geometry, or even mechanics. You have a line that runs underneath a pivot point, connect a sliding rod through a point attached to that lower line with the other end attached to that higher pivot point. Now slide the bottom point along the lower line and reproduce this exact graph. I dont get it - but as a not particularly knowledgeable random person on the internet I'm happy to be proven wrong! Edit: If the latest data point IS a minimum, and therefore a minimum higher than the others, that's surely just one point and not particularly evidence of a trend surely. Connecting those other points to this one still doesnt look valid scientifically. I believe I understand you now. But my very limited understanding of the mechanics involved are that loss of albedo from summer sea ice leads to increased warming of the oceans, and (at least potentially) more water vapour. Thus the three seem connected to me. 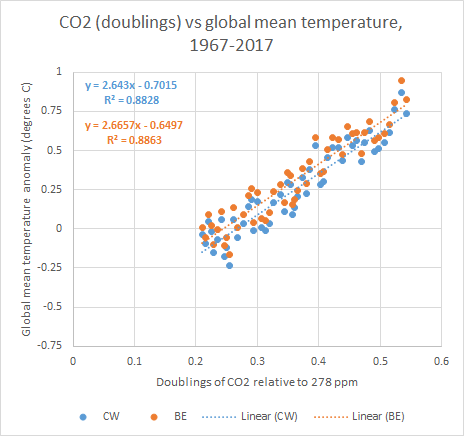 AbruptSLR's post confirms that the oceans are warming significantly, though the rate of increase appears to be linear not to have changed since about 1990 (or maybe earlier). I guess I don't have much to offer in terms of intelligent discussion at this point. I definitely agree that the arctic temp anomaly graph I posted could be read as a point acceleration with two lines; but I think it could also be read as showing an increase in rate of change beginning at about 2013 (on the black, annual line only), which could make the graph begin to appear more like continuous acceleration. I did read that a "change of just 1% to the Earth's albedo has a radiative effect of 3.4 Wm-2, comparable to the forcing from a doubling of carbon dioxide"
No idea where the number comes from unfortunately. But I did some quick math. Surface Area of the Earth is 510,064,472 km2. 1% change would be 5,100,644.72 km2. The 2000-2009 avg. for summer minimum sea ice in the arctic drops 968,139 km2 from the 79-99 avg (almost .2%). See the graph I've attached. Still I wanted to offer up these back of the envelope calculations, since if I’m lucky enough to receive any criticism, it will be quite the education for me and probably some other lurkers. Yes, the last point is a minimum. You're right that it's not a valid scientific argument, but if you were expecting acceleration to begin appearing out of the noise, then it is one small piece of evidence that is suggestive that this has begun. Obviously Hansen has been expecting this, and he has enough credibility that it's worth noting, if nothing else (he famously -- and boldly -- announced that the signal of warming had appeared out of the noise in the late 80s). Though I wish he had explained himself more completely. It might help if you consider that the ENSO phenomenon behaves as a chaotic strange attractor, and the mathematics of Chaos Theory indicates that such strange attractors are better characterized by their nodes (La Nina events) rather than the intervening excited states (El Nino events). Thus in the attached image from Hansen (2018) the fact that the trend lines for La Nina events are becoming steeper faster than either the average trend line of the trend line for El Nino events; means that the Earth's climate state is likely shifting into one more dominated by more active ENSO behavior; which most climate models indicate will have a higher Equilibrium Climate Sensitivity, ECS, than we have been recently experiencing. This graph and the idea behind it is perhaps more complicated than I assumed. I will have to give it some thought. Ultimately the answer will be known in following El Ninas! NCEP global surface anoms through October 21. As mentioned earlier by Sark, big anomalies to finish off October. Highest dailies in 2.5 months with likely higher values to come. Lagged temperature effect following ENSO is such that we are likely near a global temperature minimum even if it hasn't already been reached. Still it is clear the last La Nina was pretty weak so it does seem dubious to connect strong La Nina minimum to weak La Nina minimum. I think Hansen is getting a bit carried away with talk of more than a doubling in rate. 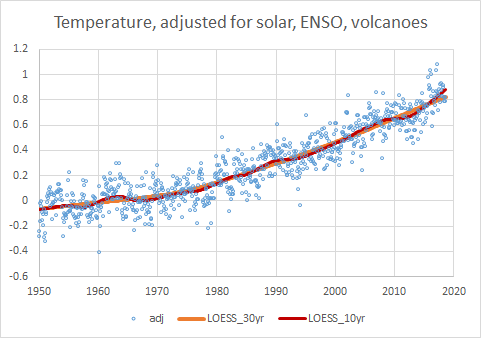 If there was valid reason for doubling of the rate over just a few short years, why has the temperature record from 1970 to date looked pretty much like a straight line? I wouldn't be surprised if Hansen does publish a paper claiming acceleration in rate is now detected. However if this happens then I would predict that this detection will be of a very weak acceleration not anything anywhere near a doubling in rate. If we say snow and ice average 0.57 and open water looks like about 0.07 then you have a change in albedo of around 0.5. So perhaps your figures are a further factor of two from explaining the size of the effect. I think your numbers are correctly telling you that arctic sea ice retreat is not hugely significant. I think land areas formerly covered by snow may well reveal larger numbers. Rutgers has some numbers if you want to play with them. Thanks! Only so much constructive criticism possible when someone is as far wrong as I was. Assume that there's an average Rc=0.5 albedo from clouds, and an Ri=0.5 albedo from ice during the summer due to melt ponding etc. (see crandles's post). To first order, the absorbed radiation is then (1-Rc)(1-Ri) = 0.25 * top-of-atmosphere (TOA) irradiance. Take away all the ice, and assume that Rw=0.07 albedo for water. Now the absorbed fraction is (1-Rc)(1-Rw) = 0.465 * TOA. So the effective change in albedo in areas where sea ice disappears is more like 0.22. That's assuming that the additional open water doesn't increase cloudiness, in which case it would be slightly lower still. So for an extremely rough ballpark estimate, take your 1.36 W/m2, and multiply it by 0.22 (net albedo change) and then divide by 3 (at best, we're talking about only May-August here, so 1/3 of the year). It works out to around 0.1 W/m2. They state that their result is on the high range of prior work, so assume 0.1 to 0.2 W/m2. So with the appropriate modifications, your ballpark calculation method ended up pretty reasonable. Thanks for making me reasonable Ned W.
Global warming accelerated markedly in the past several years. What is driving that acceleration? 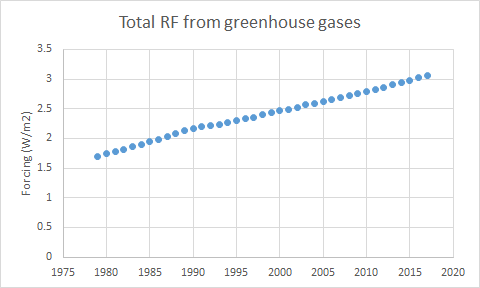 I suggest that at least a portion of the increased warming rate is probably because growth of atmospheric aerosols is no longer keeping pace with growth of greenhouse gases. Read Part II, attaching Jeremy Grantham's graph. To me; the anomalous years are between the last two very strong El Nino's and it looks more like we are heading into a follow up like 86-88 (after the 82-83 El Nino), but warmer. Does it matter whether there's an acceleration or not, while our collective mitigation efforts are close to zero? Hansen is not the only one talking about SRM, it's silly season galore and We are crazy. Adding Jan Null's ONI graph as well. The policy announced today by Canadian Prime Minister Justin Trudeau applies a tax on carbon starting at $20 per ton in 2019, rising $10 per ton annually until it reaches $50 per ton in 2022. Another point is that as CO2 increases the forcing equation will change to greater sensitivity (Curve of growth), ultimately it would be expected to change from log to square root. Methane is already at the square root stage. I'm not sure what this means re. acceleration (if anything), but seemed worth posting. The last six months in Europe have averaged nearly 2.5 C (4.5 F) warmer than historical averages for the period of April to September. This is nearly 0.8 C (1.4 F) warmer than the previous record for this six month period. Oh, and why the heck do people use a 1951 to 1980 baseline? Can we not agree on one baseline? Irritating. Certainly pretty damn scary but to me that graph looks more like the continuation of a roughly linear trend (for now) - just with a flatter bit in recent years 2000-2017ish. It means the European "no warming since 2000" hiatus is over. Or alternatively it marks the "cooling since 2018" period. Isn't it striking that this period of huge warming anomaly is coincident with the La Niña minimum (though not coextensive with)? Super El Nino spikes do seem absent. Perhaps this area does not see much ENSO correlation or even is correlated the opposite way to most areas? how did 2003 differ in that it caused upwards of 70,000 excess deaths? 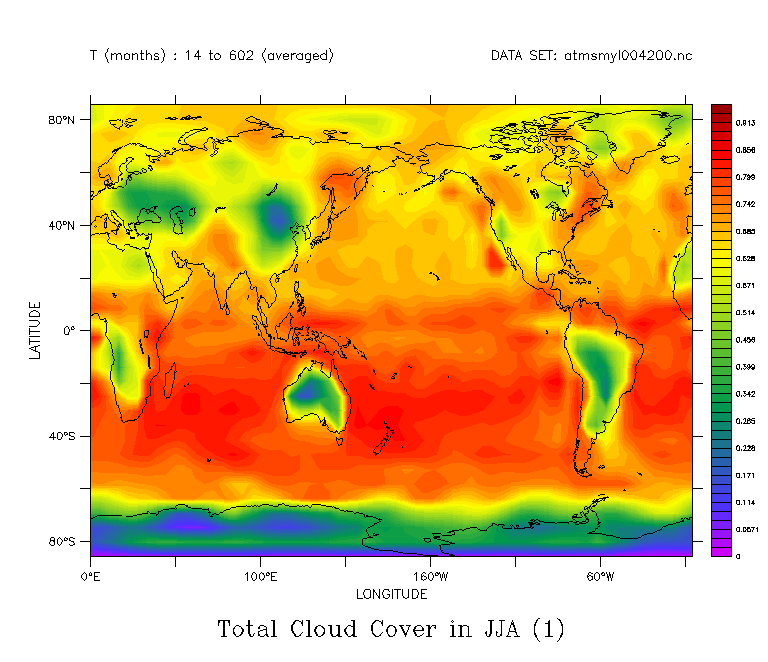 This methodology assumes that ENSO is strictly variable and that there is no GHG forcing response to the prevalence of positive IPO, nor does it consider the decadal shifts in Aerosols to SE Asia from Europe and the U.S. which has been shown in models to increase the probability of La Nina events. not a huge leap for science, just to say that even the IPCC pathways expect acceleration. Nice example of a "gish gallop" there. How does Tamino's analysis "assume ENSO is strictly variable" (whatever that means)? How is Tamino's work affected by a hypothetical change in the geographic pattern of aerosols? It was unreliable when they did it, and it's similarly unreliable when you do it. See the many posts from Tamino about why all the claims of a "pause" or "hiatus" were not statistically defensible. We need to wait longer before we can diagnose acceleration in the global temperature record. And ironically, Tamino's work makes it easier to identify "real" changes in the temperature trend, because it reduces the noise in the data. The 10-year trends in Tamino's adjusted version are approximately equivalent to 14.5-year trends in the raw data. That's a substantial improvement.